Toumani Diabaté (born August 10, 1965) is a Malian kora player who has gained international acclaim for his music. He is a versatile performer, being equally at home with the traditional music of Mali as well as with cross-cultural collaborations with flamenco, blues, jazz, and other international styles.Diabaté comes from a long family tradition of kora players including his father, Sidiki Diabaté, who recorded the first ever kora album in 1970. His cousin Maya Jobarteh is a premiere female diaspora kora player.In 1987 Diabaté released his first album in the West, a solo album entitled Kaira, recorded in one afternoon in London and produced by Lucy Duran. The album, featuring just Diabaté and his kora, is still considered one of the finest examples of solo kora.In addition to performing Malian traditional music, Diabaté has also performed and recorded in cross-cultural settings. He has collaborated with flamenco group Ketama, forming a combined group known as Songhai and releasing two recordings: Songhai I and Songhai II. He also released a memorable album with Kulanjan, bridging the gap between African and African-American music in collaboration with the American blues musician Taj Mahal. His MALIcool is another, more unusual but nevertheless successful, collaboration with the American jazz trombonist Roswell Rudd. He also collaborated with the Icelandic popular musician Björk on her 2007 album Volta. In 1999 Diabaté released the album New Ancient Strings, a collaboration with Ballake Sissoko and in September 2005, he released In the Heart of the Moon, for which he collaborated with the late Ali Farka Touré, his mentor. The album went on to win the 2006 Grammy Award for Best Traditional World Music Album. On July 25, 2006 he released his latest album Boulevard de l'Independence, recorded with his Symmetric Orchestra. In the Heart of the Moon and Boulevard de l'Independence, are both part of the Hotel Mandé Sessions, recorded by Nick Gold and released on World Circuit. Both Boulevard and Hotel Mandé are references to landmarks in Mali's capital city, Bamako.The Symmetric Orchestra led by Toumani Diabaté is composed of musicians (mostly griots) from the across the old Mande Empire of west Africa, who play a mix of traditional instruments including the kora, djembe, balafon and bolombatto, as well as modern ones like the guitar and electronic keyboard. Diabaté appeared in 2006 at the WOMAD Festival UK, Roskilde Festival in Denmark, and at the Sziget Festival in Budapest, Hungary. In 2007 he performed at the Glastonbury Festival and toured the U.S.A.. In 2008, he was at WOMADelaide (in Adelaide, South Australia). 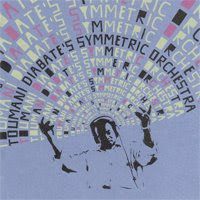 In early 2008, Diabaté released his new album of solo Kora music, The Mande Variations, to widespread critical acclaim. Many reviewers praised the album for its detailed recording of the Kora and careful mastering, in addition to the improvisational skills and wide range of apparent influences displayed on the album.